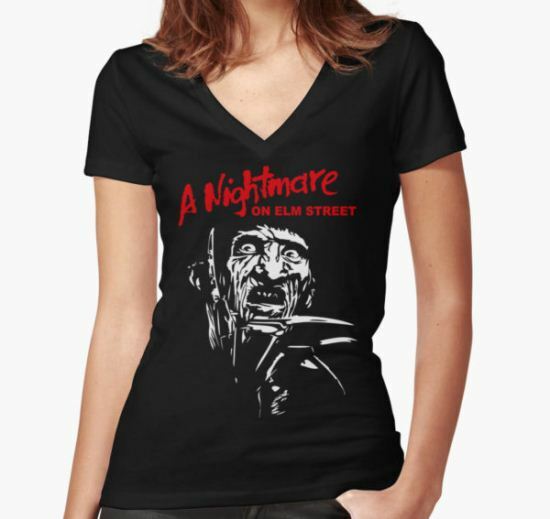 Check out our discoveries of the most awesome Nightmare on Elm Street T-Shirts below. 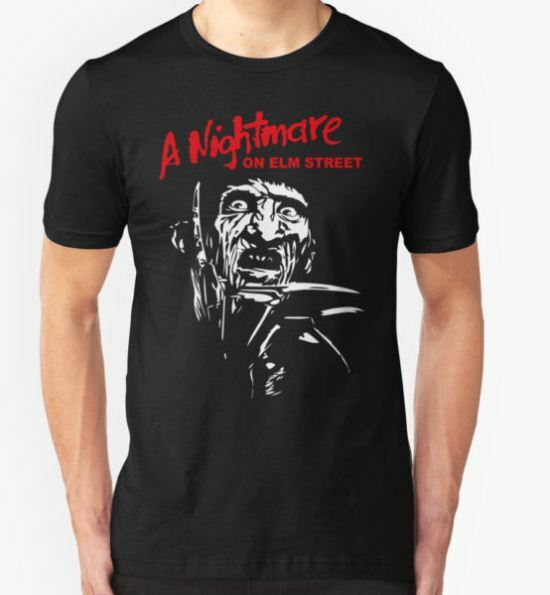 We simply find and round up all Nightmare on Elm Street T-Shirts scattered around the Internet that we think are cool so that you don't have to. If you find these Nightmare on Elm Street T-Shirts really cool, do not hesitate to share with your friends. 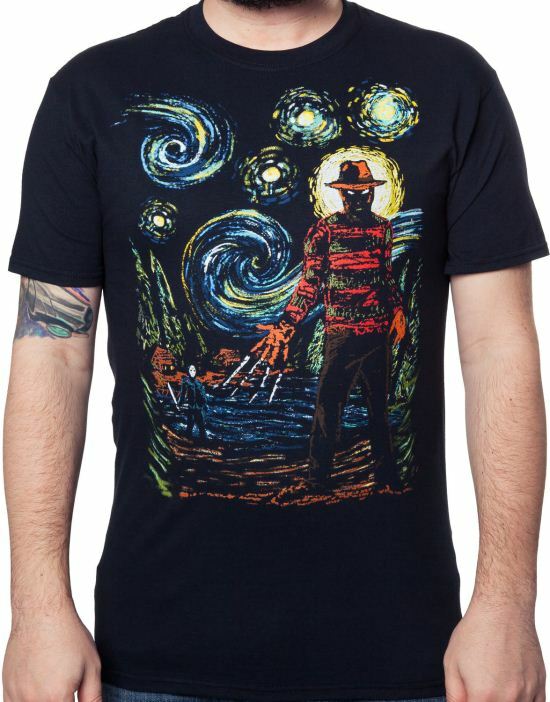 This t-shirt features Freddy Krueger and Jason Voorhees in a nightmarish interpretation of Vincent van Gogh’s finest oil canvas painting, Starry Night. 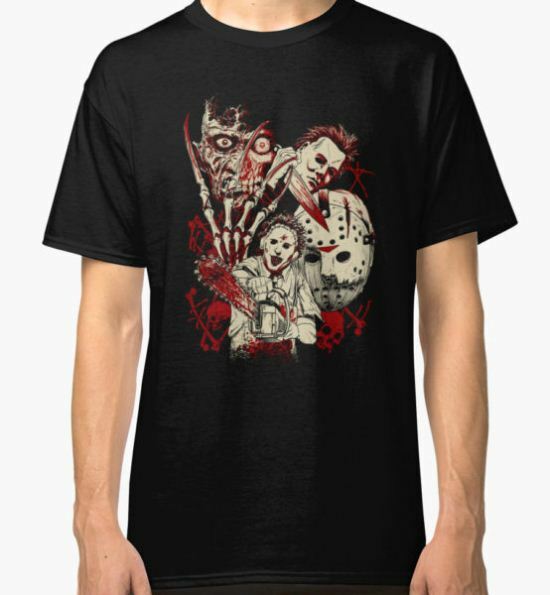 With swirling shapes and exaggerated arrangements, this shirt may look like a dream sequence, but Freddy and Jason can turn any dream into a nightmare. 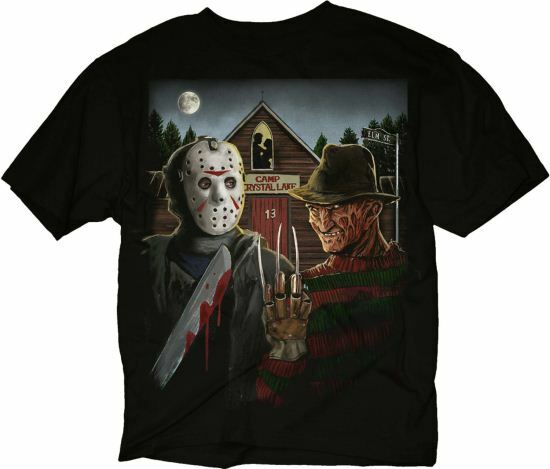 Everyone that sees you in this Starry Nightmare Freddy and Jason t-shirt will instantly recognize Freddy Krueger with his trademark razor-sharp glove, striped sweatshirt and hat. As they look closer, everyone will see Jason Voorhees with his iconic hockey mask and machete. This Starry Nightmare Freddy and Jason t-shirt is perfect for any fan of Freddy Krueger and Jason Voorhees. It’s a real scream! You’ve got the body, and he’s got the t-shirt. Freddy Krueger appears on this blood splattered t-shirt showing off his nightmarish work glove, complete with four fishing knives for finger blades. Freddy Krueger is one of the most popular villains in the history of slasher films, and now you can show that you are a fan of the son of a hundred maniacs with this juniors Freddy Krueger shirt. Freddy will be instantly recognizable with his trademark burnt face, hat, striped shirt and razor sharp glove. Everyone that sees you in this juniors Freddy Krueger shirt will know that you are a fan of the Nightmare On Elm Street franchise. Get your shirt while you can. Don’t fall asleep, don’t miss your chance. This Jason Voorhees and Freddy Krueger t-shirt shows the two slasher icons appearing in a terrifying version of one of the most iconic paintings of all time, American Gothic by Grant Wood. 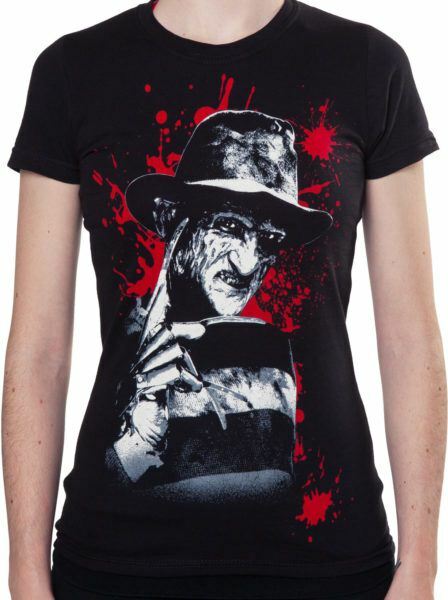 This shirt shows Freddy Krueger holding up his razor sharp glove instead of a farmer’s pitchfork. Jason Voorhees is standing in the place of the colonial woman. Jason and Freddy are instantly recognizable with their unmistakable trademarks. Jason is wearing a hockey mask and holding a bloody machete. Freddy appears with his burnt skin, striped sweater, fedora and glove. The shirt shows Camp Crystal Lake cabin number 13 on Elm Street. The silhouettes of two young lovers are seen in the cabin window…this won’t end well for them. For any fan of the Friday the 13th and Nightmare on Elm Street franchises, this American Gothic Slashers t-shirt is a must have! This American Gothic Slashers t-shirt’s reign of terror will be legendary! 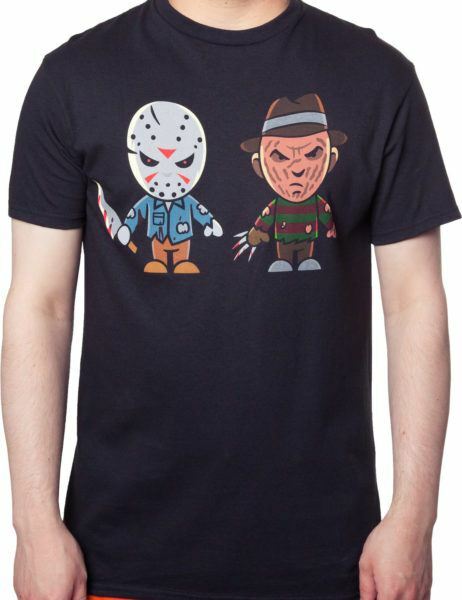 Even though they are the two most dangerous and maniacal killers in the history of slasher films, Jason Voorhees and Freddy Krueger look adorable on this Cartoon t-shirt. Jason is shown wearing his unmistakable hockey mask and holding a bloody knife. Freddy is shown wearing his iconic razor-sharp glove, green and red striped sweater, and his fedora. 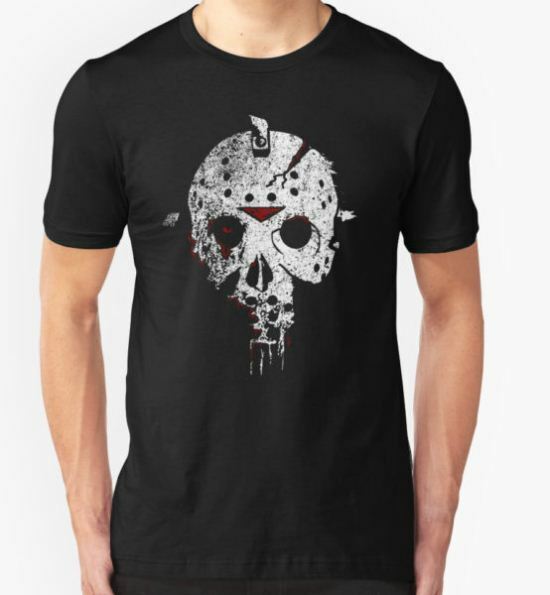 For any fan of the Camp Blood killer and the Springwood Slasher, this Jason Voorhees and Freddy Krueger Cartoon t-shirt is a must have! Whatever you do, don’t fall asleep while wearing this Jason and Freddy t-shirt. One, two, Freddy’s coming for you on this blood-splattered t-shirt. 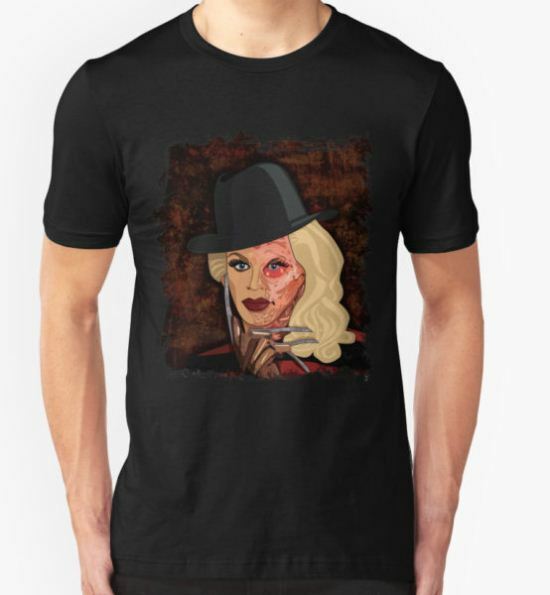 This shirt features a close up image of the iconic slasher character Freddy Krueger wearing his unmistakable fedora and razor sharp clawed glove. Freddy Krueger is one of the most instantly recognizable villains in cinematic history. Everyone will know that you are a fan of the Dream Demon each time you wear this Freddy Krueger t-shirt. 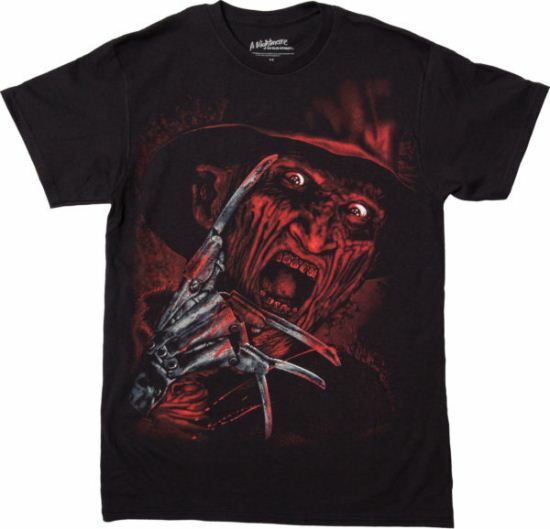 Whatever you do, don’t fall asleep, don’t miss your chance to get this Freddy Krueger t-shirt! Fun fact: A young Johnny Depp appeared in the original Nightmare On Elm Street movie as Glen Lantz. In the 1988 movie A Nightmare On Elm Street 4: The Dream Master, Freddy Krueger showed his love for pizza, as he picked a shrunken head off of a slice and devoured it. If Freddy Krueger loved pizza enough to open his own pizza parlor, the advertisements for the parlor would look like the image on this Freddy Krueger Pizza t-shirt. The shirt shows Freddy with his razor-sharp glove piercing a piece of pizza as Krueger eats it. 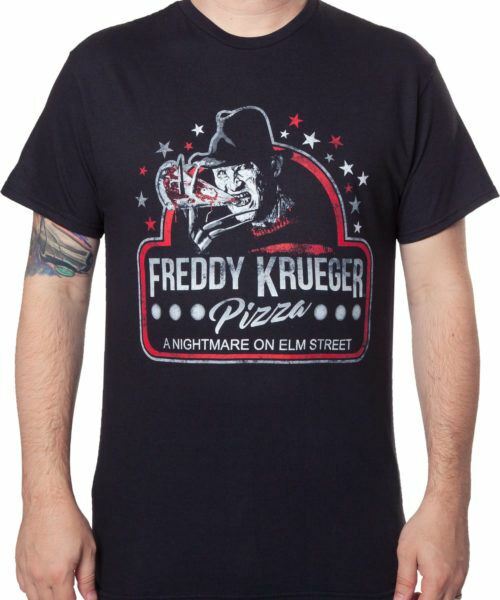 For any fan of the Nightmare On Elm Street franchise, this Freddy Krueger Pizza t-shirt is a must have! Another election year…you could put up with the back-stabbing speeches and the murderous campaign trails, but why not just leave all of that up to Freddy and Jason? They are already the kings of slasher films. Now, you can show that you support the Freddy and Jason political agenda with this Krueger and Voorhees racerback tank top. This cool and comfortable racerback tank top is designed to look like a demented political poster. The blood-splattered tank top shows Freddy Krueger’s razor sharp glove and Jason Voorhee’s unmistakable hockey mask. The tank top reads Freddy Krueger Jason Voorhees 2016 Let Us Take A Stab At It. Their reign of terror was legendary. Their reign of political power will be to die for. 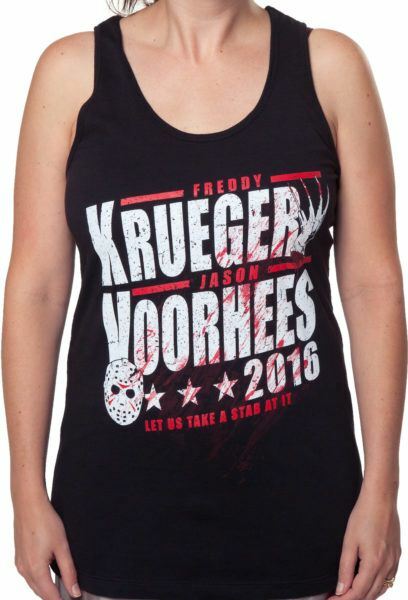 Let everyone know who you support in the 2016 political race with this Krueger and Voorhees racerback tank top!